Modern version of Bonjour Browser. Is there a better alternative to mDNSBrowser? Is mDNSBrowser really the best app in Network category? Will mDNSBrowser work good on macOS 10.13.4? 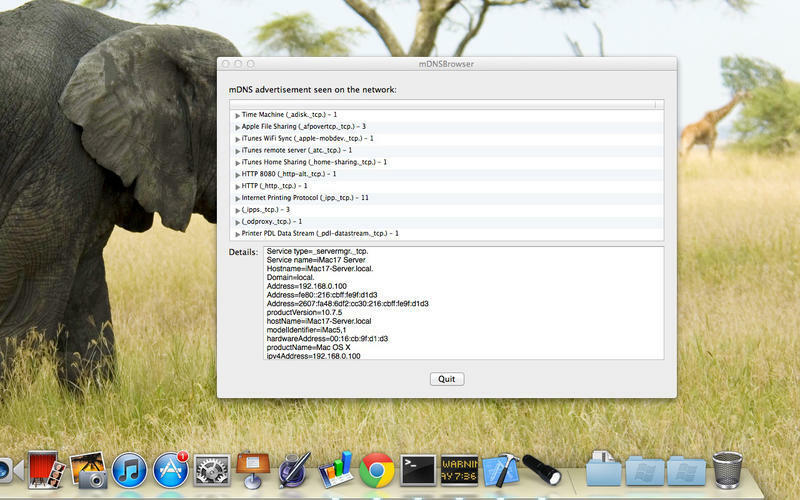 mDNSBrowser will provide a detailed list of all the Bonjour network advertisements that are broadcast on your local network. It lets you see TXT keys, resolved addresses, and link-local names. It scans for any present service available on a machine running OS X 10.6 Snow Leopard or later. It also comes with a large list of known services (200+). mDNSBrowser needs a rating. Be the first to rate this app and get the discussion started! If you purchase a copy of mDNSBrowser you will also be able to use handyPrint for free (no donation needed). handyPrint 3.1.2 or later will recognise mDNSBrowser as a license and will allow you to use the application without being prompted to donate and enter a license. This is our way of saying thank you for buying mDNSBrowser.